FOOD SAFETY: NUISANCE CREATED BY NON-RECYCLABLE PLASTIC WASTES. NUISANCE CREATED BY NON-RECYCLABLE PLASTIC WASTES. Nowadays, there is marked increase in the usage of "USE & THROW" disposables. While, it is very essential in the fields of medicine and surgery, it creates a lot of nuisance in the field of food related field. Through the last two decades, plastic use & throw cups, carry bags have replaced good old glass and ever-silver utensils. People throw them indiscriminately on the roads, which moves fast in to the nearby drains to make them choke. They not only block the channels and drains, but also prevent the rain water from percolating in to the soil and thereby affects the ground water table also. Recently, the Tirunelveli Corporation Council has also banned the usage,storage and manufacturing the once use and throw carry bags and plastic cups. Repeated warnings did not fetch a favourable change among the minds of traders. 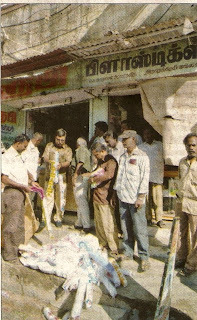 We started our raids in the wholesale shops which sell "use & throw" plastic carry bags and cups. Amidst, strong resistance from the shop-keepers to seize their products, we seized the banned articles worth Rs.5000/- and warned the traders not to continue the selling of "Use & throw" plastics. They get serviceable on a daily basis, typically within the morning, by parks workers. Then they are going on to try to two different works on the park grounds. PFA RULINGS FOR PROSECUTION-PART III. HIGH COURT COUNTER FOR FOOD ADULTERATION CASE. HAVE YOU EVER NOTED THEM?